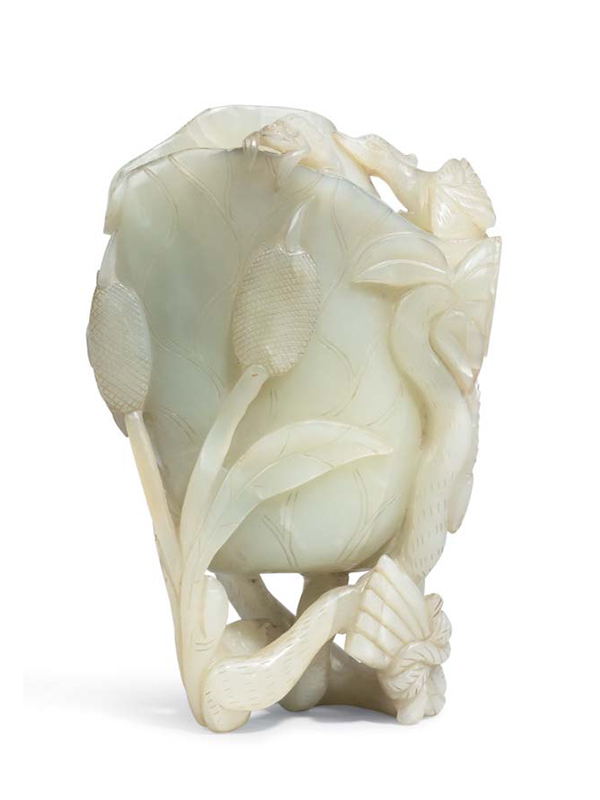 A nephrite vase in the form of a large, clustered lotus leaf, bunched with small lotus pods and reeds, the twisted stems forming the base. The exterior is carved in high relief with a carp, an egret and a three-legged toad. The semi-translucent stone is well polished and of uniform pale celadon colour. This lotus vase group, which reminds one of a lotus pond that is a common scene in Chinese landscape, is in both form and decorative features imbued with symbolic meaning. The Chinese characters for ‘egret’ (lu) and ‘reed’ (lu) are homophones for the character for ‘road’ (lu), and the character for ‘lotus’ (lian) is a homophone for the character for ‘continuous’ (lian). Together they form the pun, ‘May you pass your exams all the way’ (lu lu lian ke). Two comparable jade lotus vases, both dated to the Qing dynasty, are in the collection of the Palace Museum, Beijing. One is of similar size and colour, also with a design of lotus leaves and pods, but with protuberant stems on the side of the vase. The other is much larger, with a comparable design of lotus leaves and pods and with an egret standing on one of the elongated stems. 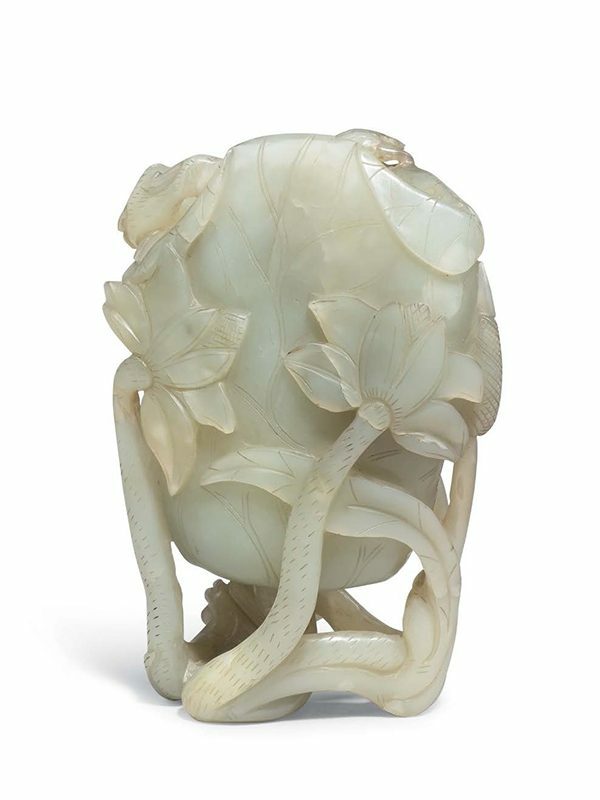 A more elaborately carved greenish-white jade, dated circa 1700-1800, of comparable design, in the form of a lotus plant decorated with four birds, is in the collection of the Fitzwilliam Museum. Another jade vase, the vessel and the lid both in the form of lotus leaves, surrounded with birds and flowers, is in the Baur Collection.